On Sunday we held the commissioning service for the Reception Class of St James’ School which was to welcome them into the school and ask God to watch over them now and as they grow up. Our children are born innocent and are closer to God than most of us, not being corrupted by the bad things of the world. While we cannot keep them completely isolated from those things, with the help of God we can help them to make the right choices so that they are able to reject what is bad when they do see it. The Lord will protect those who let him into their lives. Also as it is the beginning of Advent, we have given out Advent calendars that come with a story explaining the real meaning of Advent and Christmas instead of the meaningless commercial propaganda that we are bombarded with from the TV and that adorns many so called Advent calendars. If you want one for your child they are free from church. 14 “Again, here is what the kingdom of heaven will be like. A man was going on a journey. He sent for his slaves and put them in charge of his money. 15 He gave five bags of gold to one. He gave two bags to another. And he gave one bag to the third. The man gave each slave the amount of money he knew the slave could take care of. Then he went on his journey. 16 The slave who had received five bags of gold went at once and put his money to work. He earned five bags more. 17 The one with the two bags of gold earned two more. 18 But the man who had received one bag went and dug a hole in the ground. He hid his master’s money in it. At first sight this passage might appear to say “Go out and get rich…” but it is in fact saying something very different. Jesus always spoke in parables in order that the people of the day would easily understand and business was something they all understood – as they do today. The bags of gold given out, represent the knowledge, love and talents given to us (the slaves) by God (the master). The return on them in turn represents the extent to which we share those things to show more people His love. When we hear the message, we are to share it with as many as possible in order to give those people the joy it brings, and the chance to be part of God’s Kingdom. At the second coming of Christ, he will ask us what we have done with the knowledge he has given us – have we kept it to ourselves, or have we shared it with others? When I heard this message in church this morning was I to think “Okay that was a good sermon Tim” and come home and watch TV and forget all about it; or was I to spend a bit of time putting this on the internet where it can be seen by others? Equally others will talk about the message at work or even in the pub. If you have read this and want to know more, then please come to one of our churches and someone will gladly answer your questions – we hope to see you soon! Here Jesus once again exposes the hypocrisy of the Pharisees and teachers of the law. They tell others to follow the Commandments of God, yet they do not follow them themselves. They are full of self importance but have no humility; nor do they act in a righteous manner unless someone is watching. The reason Jesus always questioned the Pharisees was that they were the leaders of the established church at the time and knowing the scriptures as they did, they had no excuse for not living by them. A modern example of this hypocrisy might be a politician who publicly professes to support “Christian Values” and yet once in office advocates policies such as austerity that are blatantly unchristian and not in the interests of the people. Equally, I’m sure we’ve all met people who are regular churchgoers and appear to be “pillars of the community” but in private treat others badly, or gossip about them behind their backs. This passage on the Greatest Commandment is about love – both of God and our neighbours – but also about truth. Once again the pharisees try to trick Jesus with their questions but only lies can be caught out in this way while the truth can not. The Old Testament scriptures said that the Messiah would come from the line of David, and Joseph (who was married to Mary) was indeed directly descended from David in human genealogy (Matt 1 6-16). Jesus though always refers to “My Father in Heaven” meaning that He is the Son of God and David too referred to the Messiah as his Lord – not his son. The Pharisees – in the way of those who have turned away from God, again try to trick Jesus into giving them an excuse to arrest him, but this fails with the answer He gives them. The money that is paid to Caesar was created by Caesar and therefore is his to demand. Today’s parallel might be the government. God though created and owns the Earth and all that is in it, including us humans. What then can we give to Him who already owns us? As in the Parable of the Vineyard, this parable tells of the people turning away from God and rejecting the ones (prophets) that He sends to speak to them. They are too busy to listen and would in any case rather do their own thing.These people then lose their place in the Kingdom of Heaven and others are invited in their place – both good and bad. The one not in wedding clothes represents the ones who have still not accepted God’s Word and Jesus as Lord, and who continue to trust in other things. They shall not enter the Kingdom. 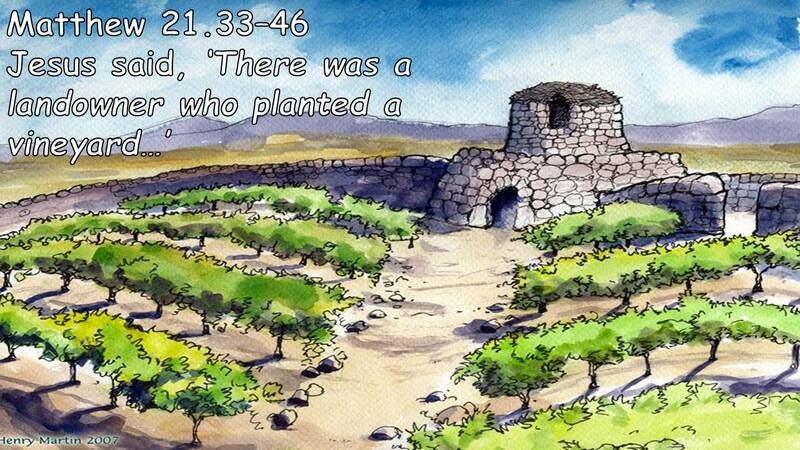 In this parable the vineyard represents the world, and the farmers the pharisees and religious leaders entrusted with it. God is represented by the landowner, and the prophets he sent by the servants, while Jesus is the landowner’s son. So those appointed to do God’s work rejected his word along with those He sent. Their inability or unwillingness to learn was illustrated when, even after hearing the parable, they plotted to have the Son Jesus arrested. God will instead entrust the world and all in it to those who listen to his word and follow Him while those who reject Him will perish. Jesus said, “Then I won’t tell you by what authority I am doing these things either. 29 “ ‘I will not,’ the son answered. But later he changed his mind and went. 30 “Then the father went to the other son. He said the same thing. The son answered, ‘I will, sir.’ But he did not go. Jesus said to them, “What I’m about to tell you is true. Tax collectors and prostitutes will enter the kingdom of God ahead of you. 32 John came to show you the right way to live. And you did not believe him. But the tax collectors and the prostitutes did. You saw this. But even then you did not turn away from your sins and believe him. The chief priests and elders behave like the second son who pays lip service to his father’s request but fail to act on it. They are supposed to be the spiritual leaders of their people but fail to see the authority of God in John – or in Jesus- preferring to trust in their own importance instead. Maybe they did believe John to be a prophet but if they acknowledged him to be so it might have undermined their own authority for that was all they were interested in – not the truth so they would rather avoid the question. How many of today’s politicians behave like this? The first son refused his father’s request but when he thought more about it he did as instructed. Likewise the tax collectors and prostitutes did the same; they were not perfect – sinners even – but they did come to believe John and Jesus had been sent by God which was more than the religious leaders did. They therefore would enter the Kingdom of Heaven ahead of the self righteous leaders. 20 “The kingdom of heaven is like a man who owned land. He went out early in the morning to hire workers for his vineyard. 2 He agreed to give them the usual pay for a day’s work. Then he sent them into his vineyard. 3 “About nine o’clock in the morning he went out again. He saw others standing in the market doing nothing. 4 He told them, ‘You also go and work in my vineyard. I’ll pay you what is right.’ 5 So they went. 7 “ ‘Because no one has hired us,’ they answered. In this parable God is represented by the vineyard owner and the people by the workers in the vineyard. God’s reward for those who choose to follow Him is everlasting life and this is the case regardless of when you do so. In other words it is the same for those who have followed Him all their lives as for those who begin to follow Him much later. The “payment” is not then a reward for how long you have followed God but a free gift for all his followers both lifelong and new. In the following parable Jesus explains not only how forgiveness works; but also that we must treat others how we would want to be treated ourselves. The bad servant – even after having been forgiven himself – did not forgive the second servant and so ended up being treated how he had treated the other man. If he had learned his lesson and forgiven the second servant then he too would have remained forgiven. 22 Jesus answered, “I tell you, not seven times, but 77 times. 23 “The kingdom of heaven is like a king who wanted to collect all the money his servants owed him. 24 As the king began to do it, a man who owed him 10,000 bags of gold was brought to him. 25 The man was not able to pay. So his master gave an order. The man, his wife, his children, and all he owned had to be sold to pay back what he owed. 26 “Then the servant fell on his knees in front of him. ‘Give me time,’ he begged. ‘I’ll pay everything back.’ 27 His master felt sorry for him. He forgave him what he owed and let him go. 28 “But then that servant went out and found one of the other servants who owed him 100 silver coins. He grabbed him and began to choke him. ‘Pay back what you owe me!’ he said. 30 “But the first servant refused. Instead, he went and had the man thrown into prison. The man would be held there until he could pay back what he owed. 31 The other servants saw what had happened and were very angry. They went and told their master everything that had happened. 32 “Then the master called the first servant in. ‘You evil servant,’ he said. ‘I forgave all that you owed me because you begged me to. 33 Shouldn’t you have had mercy on the other servant just as I had mercy on you?’ 34 In anger his master handed him over to the jailers. He would be punished until he paid back everything he owed.